I think everyone has had to deal with their kids spending too much time in front of a screen. Be it a television, computer, tablet, cell phone or any other electronic item that has a screen. Dating my self somewhat. Our first TV was black and white and got two channels and only one had anything good on. We didn’t get a computer until my teen years. Now our house has one TV with 100+ channels with at least 5 directly aimed at my kids. We have four operational computers assuming my wife hasn’t brought home her work computer. There is a tablet and our smart phones. “Daddy can I play Angry Birds on your phone please?” Needless to say there was too much screen time and not enough everything else. The idea I use, that I probably got from somewhere else, is to allow them a certain amount per week. This is accomplished with tokens each worth 1/2 hour of screen time. They get six tokens per week. They can spend them how they like as long as it doesn’t interfere with chores or school work. If they want to spend them all in one day that’s fine. They have never tried to do that. If two people are watching a show then I need tokens from both of them. If they use an item with a screen with out giving me a token the punishment ranges from a token, double token or all the tokens. Never had to use the last one. If they are out of tokens then they lose from next weeks allotment. I also don’t allow them to carry over. One because I don’t want them saving them up. Two I would get the ‘We were camping all last week so I have 6 from then…” Three I only have six of each and don’t intend to make more. We also have exceptions. Saturday night is frequently movie night and I don’t charge for that. I also don’t charge for anything I deem educational. There are very few items on that list. If they are creating something on the computer like drawing or creative writing that is also free. 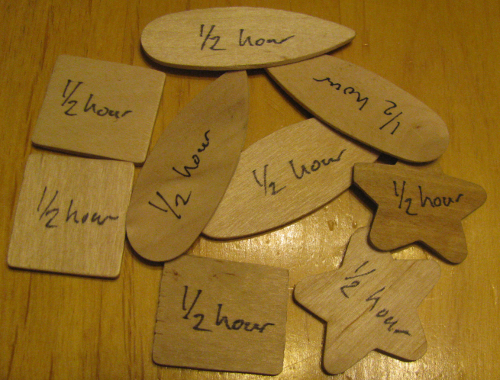 For the tokens I bought a large bag of wood shapes from a dollar store. It took me a couple of minutes to find 6 of each shape I wanted in the same size. The I just wrote ‘1/2 hour’ on each with a sharpie pen. Each kids has their own container and I have a master one so hopefully I don’t loose any. We have had success with this method. I have on occasion dropped the ball and stopped collecting or lost some of the tokens. We are actually on the second set my fault not the kids. They guarded them like gold. Overall there are less fights without the ‘It’s my turn on the computer’. They play more and are more imaginative and creative. This will will our first year homeschooling so one of the concerns was where we would have him work. The obvious answer was at my wife’s desk in our office. She never uses it and in had become a pile of all things ‘Important’. I’m guilty as well. 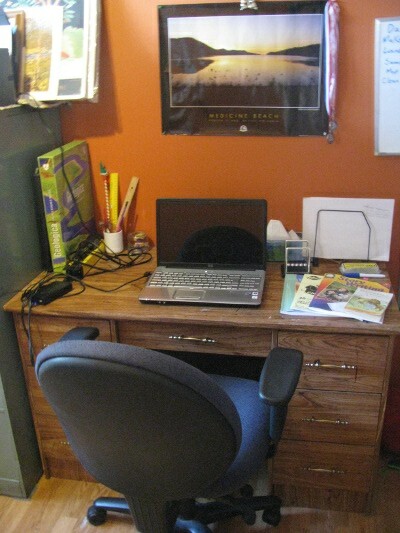 A day of sorting revealed that it was indeed a desk. I put some of the curriculum I have on the desk. The book on top is ‘The Lion, the Witch and the Wardrobe’. The laptop is my wife’s that she doesn’t need during the day. The kids have their own computer downstairs he can use in the evening if needed. During the day I want him in sight. The stuff that wasn’t garbage or recycling needed a home plus I was going to need some more storage for curriculum and other material. 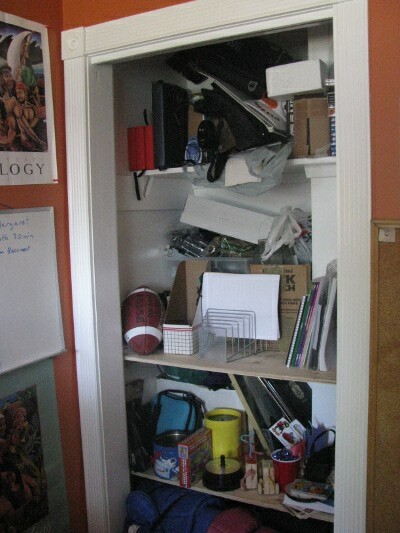 As this office was once a bedroom I put shelves in the closet. The goal was to have boxes in the back and school material in the front. Over the last couple of weeks thing have migrated into the closet that need to be resorted. 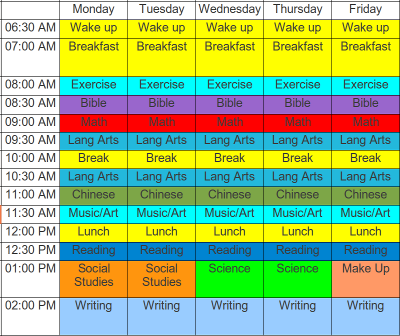 I probably won’t do it until my curriculum arrives so I have something to fill the space with. Organization is going to be a challenge. 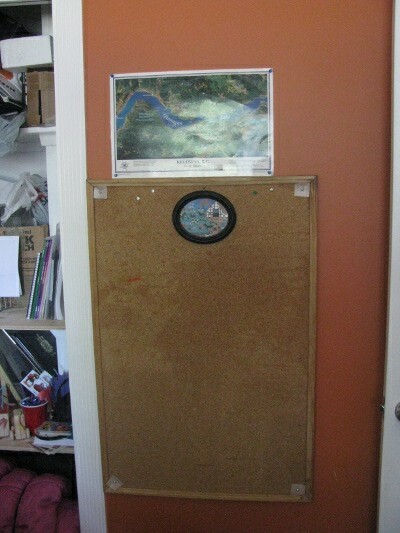 I have a ancient cork-board for anything that we want to display. You can see some water staining on it and there was nothing on the back to attach it thus the 4 screws with cardboard in the corners. 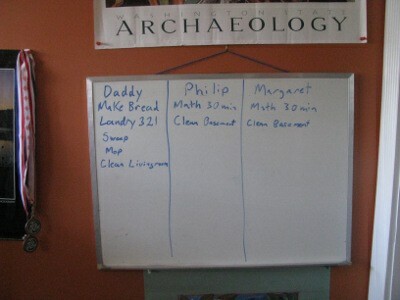 The final thing was a whiteboard again I’m not sure where it came from but its been re-purposed as a to-do list. We’ve been using it through the summer and it was been working great. The kids love to be able to cross items off their list. I redid the board for the morning. With all the crossing out from Friday it was a mess. We have decided to homeschool our oldest who is about to go into grade 5. The reason for doing this are numerous. The main reason is that he interacts better in smaller groups. This is something that I can provide through homeschooling. The second is that we have more control over the content and the speed of the curriculum. We can speed it up and not worry about leaving people behind. We can customize the content to be more of what he is interested in. We can go into it deeper if we like and if he doesn’t understand it will be easier to remedy. It comes down to personalized vs mass produced. What would you prefer a mass produced McDonald’s sundae or one made with homemade everything personalized the way you like it. First I should explain the variations that we have here in BC. First there is registering for homeschooling. That means no funding, no supervision, no criteria. Meaning that I could teach him anything I wanted including outright falsehoods and the government would do nothing. Needless to say that is NOT the path we are taking. The second and the path we are taking is called distributed learning through Heritage Online Christian School. The details differ from school to school. With them we get a teacher assigned to use to provide guidance and mark a portfolio that we provide. We would get report cards with letter grades based on that material. We are required to meet Provincial Learning Outcomes which means the school gets funding from the government. They then pass on a portion of that funding to us to use for material. The second thing is that there are co-ops where we as parents get together and hire someone to teach a particular course to a small number of kids. I intend to pick at least one of these so that he has a group setting to work on his social skills in. There are also group activities/field trips planned throughout the year that would provide the same. So for curriculum they have a package that we can purchase through a local homeschooling store. So rather than reinventing the wheel I started with that. There were a couple of areas where I am choosing to substitute material. The first is with Foreign Language, which we are required to provide at this level. Normally given that we are in Canada this would be French but my son has long had a fascination with China, thus he wants to learn Chinese. At this level he doesn’t need much. Its more of an introduction. So we are going to be using an online version of Rosetta Stone that is offered through Heritage. I am also going to have Grandma who is Bilingual teach him the few phrases he needs for French. Second is science. I didn’t like the book that they had in their package. Now I may of not given it a fair chance but it was also expensive. I am Catholic and believe all that entails but when it come to science I want to dig deep into why and how. The book had a very shallow explanation and the deeper was all ‘Its God’ I have already had to reconcile the existence of God and the big bang to my kids. I know that he would question some of the statements in the book and thus I feel that it would hurt his faith not help it. As a result we are going to be using the textbook (Probe 5) used by the public system plus my own knowledge. The third is more of an addition. We are considering adding Student Writing Intensive from Excellence in Writing. Writing is the course that worries me the most. Its not my strongest subject although I have improved from my school days. Its also not his best subject. The other option is to find a local group that is teaching it. A friend of mine from church has the course and is willing to let me have a look at it before I go and buy it. Below I put my very tentative schedule. I expect this will change the first week in but I needed a place to start. Plus a schedule gives me that sense of security.